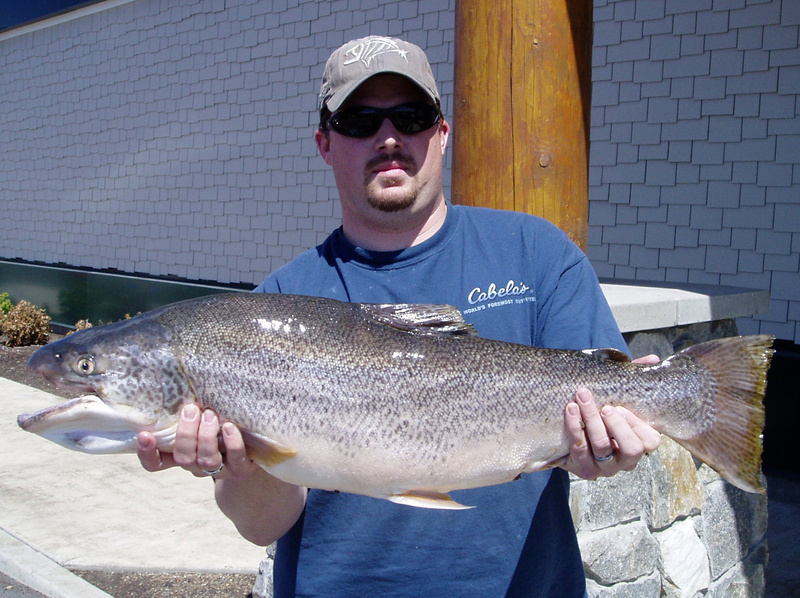 Evan Roda of Spokane Valley caught a 13.75-pound tiger trout from Fish Lake in 2008. The Eastern Washington tiger trout program, which hatched a former state record at Fish Lake in Spokane County, was curbed when a 2013 disease outbreak related to kokanee forced cutbacks at the state’s Ford Fish Hatchery. Brood-stock brown and brook trout had to be destroyed, eliminating the raw ingredients for making the hybrid tiger trout. That means Fish and Clear lakes in Spokane County plus Loon and Black lakes farther north will be among the waters getting tiger trout again next year. Some Grant County waters were able to be stocked with tiger trout that came from Wyoming, but reductions in egg availability are expected this year. A state-record trout is swimming in Jim Moore Pond in southeast Idaho. Last week, 3,600 catchable-sized tiger trout were stocked in the tiny impoundment near Roberts by the Idaho Department of Fish and Game. The fish are the first of their kind in Idaho, which makes every one of them a potential state record, said Dan Garren, fisheries manager in the Upper Snake Region. Tigers are a sterile cross between brown trout and brook trout. They are voracious predators that have been stocked in other states, including Washington, to thin populations of fish such as chubs and perch. The newly stocked tigers in Idaho are between 11 and 13 inches. They weigh roughly a half-pound, but they are expected to grow quickly – and grow quite large. • Montana, 4.04 pounds, Bear Lake. • Utah, 7 pounds 9 ounces, Boulder Mountain Reservoir. • Washington, 15.04 pounds, Roses Lake, Chelan County. Garren hopes the tigers will feast on John Moore’s stunted perch population, thinning it enough to allow the remaining perch to grow larger. Larger perch should make anglers happy. So should large tigers. Catchable-size tiger trout eventually will be stocked in waters in Idaho’s Salmon and Lewiston regions, Garren said. Since they are new to the region, Garren said anglers will have a learning curve for catching them. He suggests flashy lures and gaudy streamers.